On the occasion of the 50th anniversary of Dr. Martin Luther King's "Letter from Birmingham Jail," Samford University history professor Jonathan Bass called it "the most important written document of the Civil Rights Era." 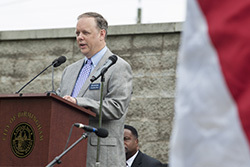 Speaking at the dedication of an historic marker outside the Birmingham jail, where Dr. King was imprisoned for his leadership of the movement, Bass called the letter "the essential distillation of Dr. King's philosophy and endures, because the argument transcends time and place. The letter provides us not only with the opportunity to understand past injustices, but it also helps us to shed the light of truth upon present injustices." Later in the day at an event at Sixteenth Street Baptist Church, where four children were killed when a bomb exploded on a Sunday morning during Sunday School, Bass led a symposium that examined the letter, word for word, with readers including Dr. King's daughter, Bernice King. The author of Blessed are the Peacemakers published in 2001, Bass examined how clergy in Birmingham responded to the racial crisis in 1963, primarily asking Dr. King to delay demonstrations and suggested that he was moving too fast on integration. The eight white ministers were moderates, Bass reported, and were "deeply troubled" over the situation and had met at the old Tutwiler Hotel to discuss an "opportunity" to have some influence on the situation. Their argument, basically, was for Dr. King to wait. The Letter from Birmingham Jail was basically a repudiation, paragraph by paragraph, of the ministers' arguments. It was written by Dr. King in the margins and given to a couple who took the bits and pieces and molded them into a letter which first was published in a magazine. The basic themes of Dr. King's letter, Bass suggested, were justification, non-violence, timing, breaking laws and extremism. "I am in Birmingham because injustice is here," Dr. King wrote. And as to timing, he wrote: "Wait? We've been waiting 340 years." And to the charge of extremism, he wrote that Jesus, Amos, Paul, Martin Luther were all extremists. Then he asked: "What kind of extremists will we be?" A panel, which included Dr. Timothy George, dean of Samford's Beeson Divinity School discussed what was and what would have been an appropriate response to Dr. King's letter. Dr. George noted that Earl Stallings, the pastor of First Baptist Church of Birmingham, invited the demonstrators, including former U.N. Ambassador Andrew Young, into the church. The panel also wrestled with what lessons are applicable today. Many issues were suggested, including the poverty, sexual orientation, immigration, the environment and liberation. Dr. King's daughter said it doesn't concern her that she falls out of favor with what is politically right but "what my conscience tell s me what is right. We have failed as a people of God for not standing up with what is right." At some point, she suggested, we come to a defining moment when we must decide to be citizens of the Kingdom of God or citizens of the country. While most agreed that much progress had been made in the past 50 years, much still need to be done to combat racism and the issues for which Dr. King fought.